hover over the compass and click on a link in the menu. Built in South Africa by Robertson and Caine, the Leopard 45 is a former Cruising World Boat-of-the-Year. 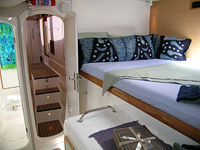 Jet Stream features four lavish queen-sized cabins with en suite heads and showers. 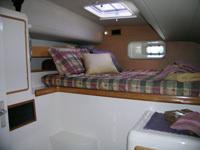 Three cabins are available for charter guests, while the fourth is occupied by the crew. 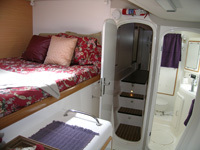 Jet Stream is air conditioned throughout, powered by a 9kw generator. For the guests’ enjoyment, Jet Stream has stereo, CD, DVD and tape players, and TV, with libraries of titles for each. 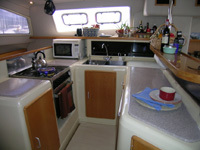 The Leopard 45 is known as a capable blue water sailboat, and Tim and Marsha enjoy sailing her at every opportunity. They also relish introducing guests to the arts of sailing, in general, or to the fine points of sailing catamarans. They encourage as much “crew participation” or relaxation as guests wish. The sunny trampoline, the shaded cockpit and air conditioned interior are comfortable venues for visiting, reading and relaxing while basking in delight at Marsha’s offerings from the galley. ©Jet Stream Sailing & Golf Charters, 2006-2008. All rights reserved.